News From Around The World ! Today, an update with news from all around the world - the world of Disney Parks, of course. Let's start by Disneyland Paris and the new mini-season which will start April 3 and last until July 4. Called "Spring festival" it will look like the previous "Flowers Festival" which happened back in 1997. A new "mini-season", so, for DLP and it"s not a bad idea, even a good one, which is expected to be enhanced each year like they do on the Halloween and Christmas seasons. And flowers in the park are always welcome! Remember when i told you a few months ago that DLP had scheduled to rebuild entirely in real stone the Indiana Jones Temple du Peril? Well, it was hard to believe but works started January 6 and the attraction will be closed until May 28. And yes, a big part of it will be rebuilt in real stone and the looping section will be changed for a brand new one. In my previous DLP update you saw pictures shot by Max Fan, D&M contributor and DLPWelcome webmaster of the new LEGO Store still in works and expected to open this month at the Disney Village. I'm sorry to report that the store grand opening which should have happened January 14 to 19 has been postponed for "unexpected circumstances". No big of a deal, we can wait for this one. Let's move to the U.S and you better don't miss Mice Age latest update which is full of insider news from the start to the end of the article. According to Mice Age the Star Wars Land at WDW Disney's Hollywood Studios is more than "on hold", may be cancelled. But not for Disneyland Anaheim where will start the remodel of Tomorrowland buildings, the section from Central Plaza to the Astro Orbiters. Mice Age reveal much more about all this so jump to the full Mice Age article HERE. And by the way, it seems that the real size Millennium Falcon with a walk-through visit is still in the plans. It might look a bit like this old Tim Delaney rendering except that the Falcon will be located up in the air on the platform where the Astro Orbiter stands now. As we know Disneyland announced that the Subs will close for refurbishment for four months but Mice Age doubt that it will reopen this year, specially if WDI finally got the green light for the Star Wars Land. Another ride will close next month for four months, but this one will reopen and it is Soarin' at DCA. Mice Age explains in details the technical enhancements with a new digital projection system, and more, so the ride could be ready for its new Soarin' over the world version scheduled to open in 2015 or 2016. The only thing that is not confirmed yet is if the new version will include several different movies that will be projected randomly, like they do in Star Tours 2. On these two rides, much more to read too on Mice Age HERE. The good news according to Mice Age is that the enhancements of old Disneyland dark rides might finally get the green light to be ready for Disneyland 60th Anniversary next year. Alice in Wonderland, Mr Toad's Wild Ride and Peter Pan's Flight are on the list and i'm particularly interested by the enhancements on the Peter Pan ride as they will include new projection effects not only on almost all the scenes but also rear projection effect on the faces of the ride main characters. More details about this in a future article if the ride finally get the green light for the new version, and in the meantime more details about Disneyland 60th Anniversary HERE. At Tokyo Disneyland Captain EO will close down "forever" June 30 to make way for a Stitch Encounter attraction, the same one that exist already at DLP WDS and HKDL and which use the same technology than "Turtle Talk with Crush". Kids will love it. A last news - a "merchandise" news - which will please those of you fans of Vinylmation figures as DLP will put on sale January 10 some cool Indiana Jones Vinylmation figures. And more to come all along January! 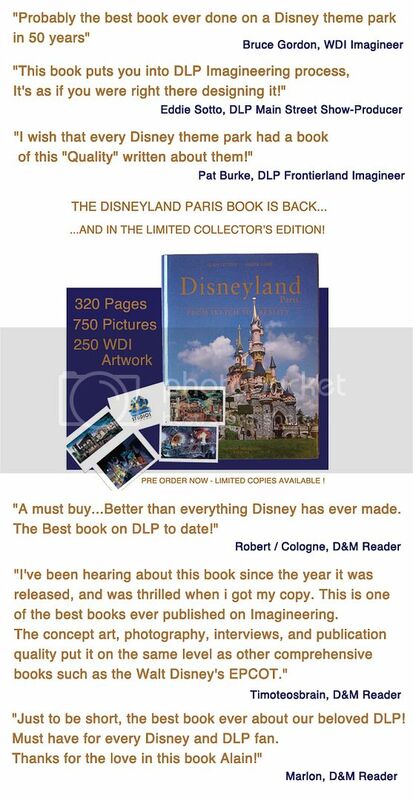 Talking about merchandise the long promo on my Disneyland Paris book is now over but all January you still can order the book and enjoy a free shipping. The full price is now 75 euros including free shipping worldwide which help to save 15€ / $20 , so it's still time to order your own copy at the best price on the market and to don't miss the great Disneyland Paris "From Sketch to Reality" book which will tell you all about the creation of Disneyland Paris with 320 pages including 500 pictures of the park and 250 WDI renderings! You can order the book by sending me an email at: neverlandeditions@gmail.com or send directly your Paypal payment of the 75 euros either by the Paypal button below or directly from your Paypal account at the same email address. The Flower Festival sounds awesome and can't wait to see it. I wouldn't say MiceAge is a credible source though and it seems like whatever they have been saying is wrong and they are always trying to cover their tracts. And no mention of the Seven Dwarfs Mine Train? I just don't understand why people are excited about a Star Wars Land. Yes, (some of) the movies are great; and yes, both Star Tours I and II are also great ... but a Millennium Falcon walk-through, really??? A great spaceship on the outside, but the inside looks pretty dull in the films ... seems like a poor walk-through to me. And the often mentioned Tatooine cantina looks on the inside equally dull with almost no theming. I can already imagine the furious reactions of Disneyland-fans to these two hardly themed Star Wars additions, which ironically need to be hardly themed if they want to be accurate to the movies. I'm really looking forward to the dark rides upgrades! I'm also against turning Tomorrowland into Star Wars land Mr. Lime, even though I'm a huge fan of the SW movies, but I do think that a Tatooine cantina may be very cool. Yes, it looks a little dull on the inside, BUT they can do great thing with all the Aliens, especially the Alien music performers from the band; if they are top notch AA aliens, it will be awesome! Anyway it is really a shame that they are closing the subs for a whole year to save money! I didn't like the Nemo version of the subs, so I don't care much about the attraction itself, but the lagoon is always beautiful to look at, especially when arriving at the park by monorail. Construction walls and an empty lagoon will ruin the view and atmosphere of this area of the park. I'm with Anonymous #1. Almost everything MiceChat/MiceAge posts is a big fat lie. As for Marco, they are not closing the Nemo subs this year to save money--the closure IS for an extensive refurbishment as Disney has said. Besides, the Nemo subs ride is awesome and does not deserve to be hated. To Anonymous 1 & 2: Listen, folks, i'm well placed to know that Mice Chat never lie intentionally. Even when they announce something and 3 months later say it is cancelled? Yes, because the big problem with a corporation like Disney is that anything can happen, specially as long as a project hasn't been announced officially. And even if it has been announced officially ( see how WDW MK New Fantasyland has changed since the first concept announced at D23 with the replacement of Cinderella Cottage, Sleeping Beauty house and the Fairy land by the Seven Dwarfs Mine Train ).
" Red Friday " Promo !!! First Look at New Pixar Short "Party Central"
A Pictorial Tribute to Walt !